This tutorial is an introduction to Qt programming and will teach you how to create an application with Qt and C++. Full project and source code are provided. Qt is a cross-platform framework and a collection of tools for creating applications which can run on desktop, embedded and mobile operating systems. If you need to create an application with a GUI in C++ you should definitely consider Qt for it. Nothing too fancy, but these are the basic elements of most desktop applications and you can use this code as starting template for your projects. When working with Qt, especially when developing cross-platform software, it’s recommended to use Qt Creator as IDE. 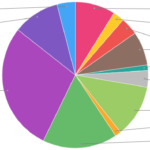 The main reason is that Qt Creator is the official Qt IDE and it offers full integration with the framework and all the other development tools. 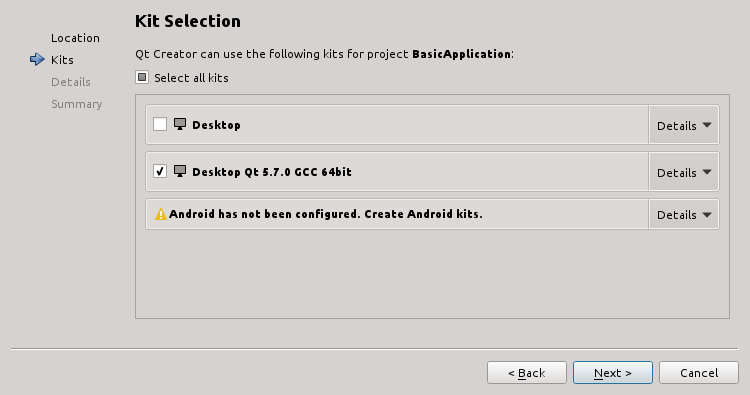 Using other IDEs is possible, but I don’t recommend it and for this tutorial I will use Qt Creator. 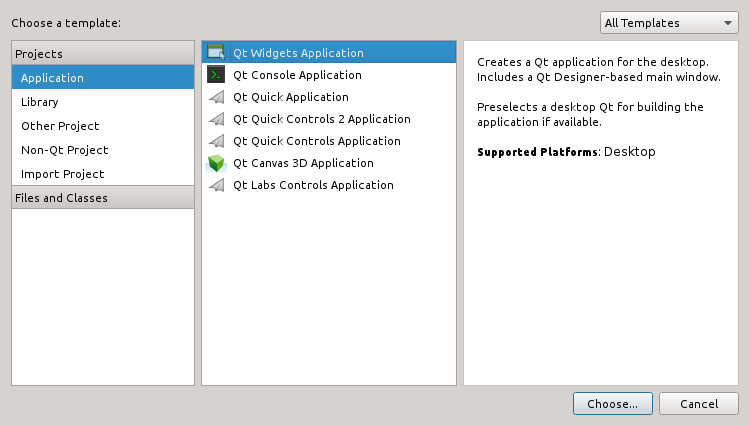 For a graphical application you want to select the Qt Widgets Application template. The second step is selecting a name for your project and a location where to save it. For my project I decided to use “BasicApplication” for the name, but obviously you can use anything you want. The third step is selecting the kit(s) for building your application. Qt Creator kits are groups of settings used for building and running projects for different platforms. I am developing on Linux so I am going for the kit Desktop Qt 5.7.0 GCC 64bit, but you might see different kits if developing on/for different platforms. The fourth step is defining the details of the initial main window class that will be generated by the template. You can leave everything as it is, but make sure to uncheck the Generate form field. The form file is used by the integrated visual interface editor Qt Designer. We won’t need it because we will be coding the GUI from scratch. 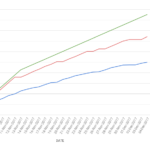 In the final step of the project creation you will get a summary of what defined in the previous steps. 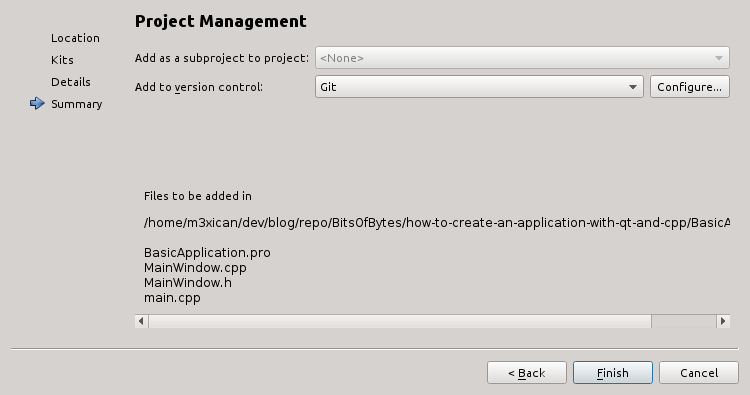 Here it’s also possible to set a version control system to use for the project, but feel free to not set any for now. Clicking on the button Finish will create the project and generate 3 C++ files (main.cpp, MainWindow.h and MainWindow.cpp) and a project file used by Qt Creator and qmake (the Qt building tool) to build the project. The last line of code launches the Qt application and waits for it to return an exit code before terminating the program. It’s important to include the Q_OBJECT macro in all the classes that are inheriting from QObject. Slots are handlers used to do something when an event happens. They will be explained in more detail later. 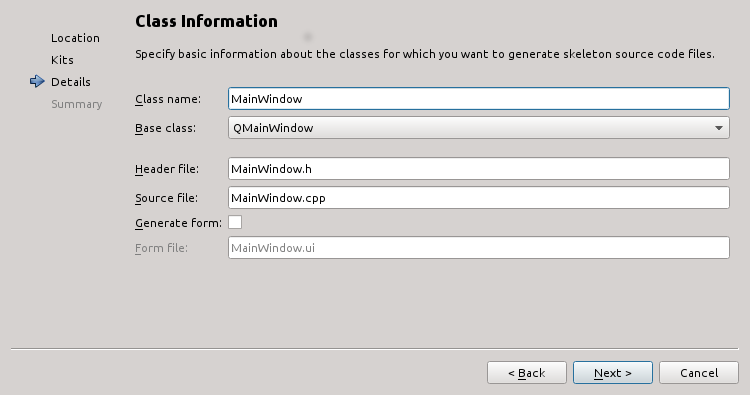 All the MainWindow methods, including the slots, are implemented in MainWindow.cpp. Most of the code will be placed in the constructor because it’s there where the elements of the window are created. The function setWindowTitle sets the title of the window, whereas setMinimumSize sets the minimum size allowed when resizing it. Once the menu bar is created you need to set it for the main window calling the setMenuBar function. The “&” before “File” will enable the keyboard shortcut ALT+F to open the menu. As you can see creating an entry and adding it to a menu is pretty straightforward. This entry is connected to the function close defined in QMainWindow which, as expected, will close the window when the menu entry is clicked. As for the menu bar, it’s important to remember to set the active status bar calling the setStatusBar function. Obviously this is just an example and a real application will do something more useful with them. Once the basic elements of the window have been created it’s time to add some content. This is done by calling the function setCentralWidget and passing it a QWidget which contains the graphic elements the application needs to show and handle. I decided to not add any central widget in my code to keep this example as simple as possible, but obviously you’ll need to do that in your application. All the Qt widgets discussed in this tutorial are documented in detail in the Qt Widgets C++ Classes section of the Qt documentation. To learn more about Qt Creator check out the online manual. 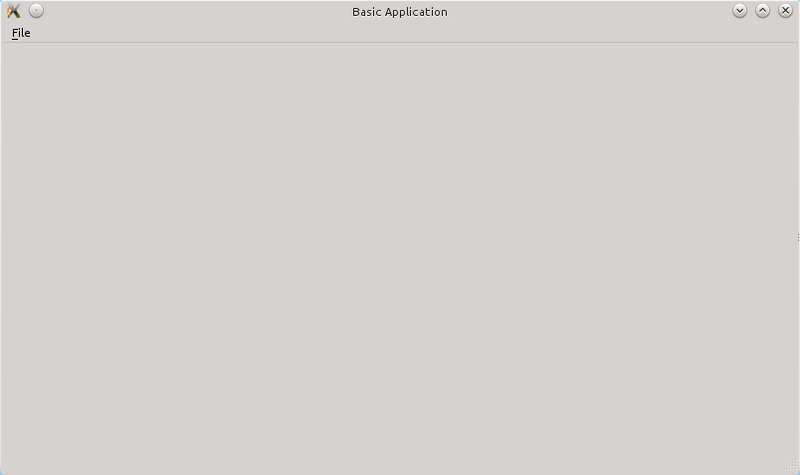 This was a simple tutorial to teach you how to create an application with Qt and C++. If you have any question about the code explained here feel free to leave a comment. If you found it helpful please feel free to share it on social media using the share buttons below.